We collect both Personal Data and non-personal data, such as Anonymous Data, about our Users (website users and customers). “Personal Data” means data that you voluntarily submit to Stacker allowing us to identify or contact you. Personal Data may include your full name, address, telephone number, email address, and payment method; as well as, any other pertinent non-public information about you that is associated with or linked to any of the foregoing data; in some instances, Personal Data may include your IP address. “Anonymous Data” means data that is not associated with or linked to your Personal Data. Anonymous Data does not typically permit the identification of individual persons, and typically consists of passively collected information about your activities on our website, through our software, or through our Services (which includes any communication/interaction between you and Stacker). Anonymous Data may include data about your printer, computer, visits to the website, your geographic location, browser type, referral source, length of visit, and pages viewed. We may collect Personal Data from you, such as your full name, email and mailing address, telephone number, bank account information, credit or debit card information, and a password if you choose to create an Account. We may potentially collect your industry, company name, Employer Identification Number (EIN), Value Added Tax Identification Number (VAT), or Social Security Number (SSN). We may retain information on your behalf, such as product serial numbers, order history, purchase inquiries, purchase orders, wish lists, and digital files (such as an .STL or .STP file associated with 3D printing). If you provide us with feedback or contact us via email for any purpose, we will collect your name and email address, as well as any content included in the email. We may also collect Personal Data from you when you interact with our employees or contractors. Additionally, we may monitor and record phone calls, video calls, emails, live chats, or other communications between you, your device, and our employees or contractors. When you participate in our surveys, contests, sweepstakes, giveaways, and educational or training classes, we may collect the information provided by you for such participation. We also collect other types of Personal Data that you provide to us voluntarily, such as your computer’s operating system, software installed, product registration number, and other pertinent information required to provide support. We use your Personal Data and Anonymous Data to provide services, to improve our website and services, to track movement around the website, and to protect Stacker and our Users. Personal Data may be used to respond to your requests and to offer more personally tailored content and services. For example, some of the Personal Data we collect may be used so that when you visit our website or use our Services again, you will be recognized, and we could provide you more relevant content suggestions, customized search results, or other information appropriate to your interests. Ways in which we may use your Personal Data include: (a) facilitating the exchange of goods and Services, (b) sending you administrative email notifications, such as sales confirmations, support, and relevant updates; (c) helping you solve any issues you have contacted us about (in such cases, we may keep a record of your communication); or (d) responding to your inquiries. We will not sell your Personal data; we do not use third-party advertising companies; and, we do not use your data for advertising purposes unless you specifically request it, such as a request to be added to our promotional email lists. Stacker will never sell your Personal Data. Stacker will retain your Personal Data for as long as your account is active or as needed to provide you products or Services, and as necessary to comply with our legal obligations, resolve disputes, and enforce agreements. Anonymous Data may be retained indefinitely. You can request that Stacker delete all of your Personal Data. Information on how to request this deletion can be found in the “Your Rights and Opt-Out Choices” section. Except as set forth below, Stacker will never knowingly disclose your Personal Data to a third party. Stacker may disclose Personal Data and non-personal data to our outside vendors and contractors (collectively known as “Service Providers”) who need to access such information in order to perform services (including, without limitation, transaction/payment processing, order fulfillment, data research and analysis, data collection and processing, data storage, data security, hosting and technical support, as well as marketing and advertising support) for us. Stacker requires that our Service Providers use your information shared by Stacker solely for the purposes of performing specific services for Stacker and that they maintain the confidentiality, security, and integrity of such information and not further disclose the information to others. Information collected by these Service Providers or integrated services is also subject to their own terms and policies. We may use hyperlinks on our website, email communication, and other online resources that will redirect you to a social network if you click on the respective link. When you click on a social network’s plugin, such as Facebook’s “Like” button or Twitter’s “tweet” button, that particular social network’s plugin will be activated, and your browser will be directly connected to that provider’s servers. If you do not use these buttons, none of your data will be sent to the respective social network’s plugin provider. So for example, when you click on Facebook’s “Like” button on our website, Facebook may receive your IP address, location, browser version, screen resolution, and operating system on the device you have used to access our website. Settings regarding privacy protection can be found on the websites of these social networks and are not under our control. Providing Personal Data is voluntary, but failing to share Personal Data may prevent you from completing an order, requesting User assistance, or accessing other Services offered by Stacker. If you provide us with your Personal Data, you have the following rights with respect to that information: (a) to review the User information that you have supplied to us; (b) to request that we correct any errors, outdated information, or omissions in User information that you have supplied to us; (c) to request that your user information not be used to contact you; (d) to request that your User information be removed from any solicitation list that we use; (e) to make a complaint; (f) to request that your Personal Data be deleted from our contacts; (G) to request a restriction of, or withdraw your consent for, the use of your Personal Data. 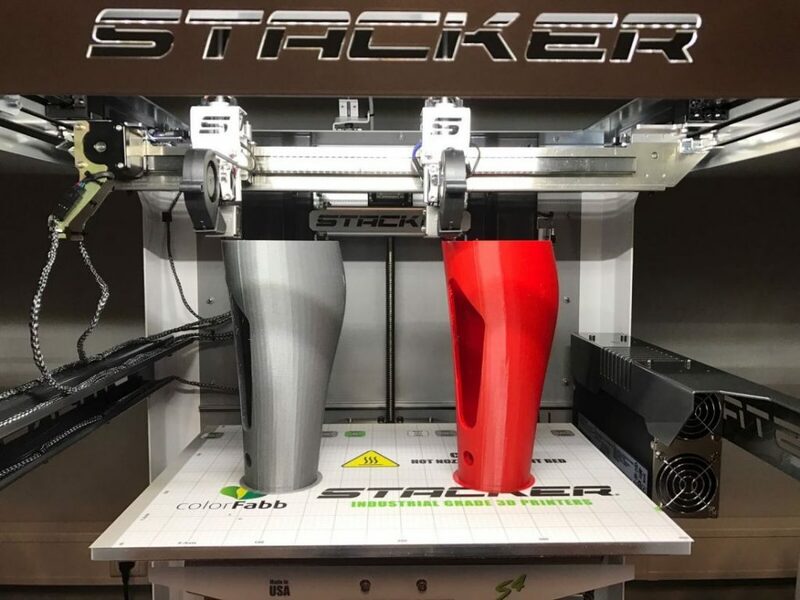 To exercise any of these rights, please contact us at info@stacker3d.com or by mail at Stacker LLC., 9303 Plymouth Ave N, Suite 101, Golden Valley, MN, 55427, USA. We will change, correct, or delete your information as soon as possible. Deleting data means that Stacker will properly and completely dispose of it (in its digital and/or physical form). In other words, it will be destroyed or otherwise disposed of in a manner that protects against loss, misuse and unauthorized access, disclosure, alteration, and destruction. If you want to delete any cookies that are already on your computer (persistent cookies), the “help” section in your browser should provide instructions on how to locate these files or the directory that stores cookies, or you can use the links below. Please note that disabling cookies may limit your access to some features of our website. Most web browsers and some mobile operating systems include a Do-Not-Track (“DNT”) feature or setting that you can activate to signal your privacy preference not to have data about your online browsing activities monitored and collected. Because there is not yet a common understanding of how to interpret the DNT signal, our website currently does not respond to DNT browser signals or mechanisms. Protecting the security of the Personal Data that you share with Stacker is of the utmost importance to us. Your information is stored in a secured environment which is only accessible by key Stacker personnel. When sensitive Personal Data (such as Customer Payment Information which typically includes your name, billing address, credit card/debit card information, and telephone number) is collected in our store, it is protected and processed by a third party processor through a secure connection. Stacker is not responsible for customer payment processing. Unless you choose to share your sensitive Personal Data over the telephone, by mailing a letter, or via electronic communication with Stacker, we do not save, have access to, or maintain direct control over any Customer Payment Information. Whenever credt/debit card information is shared with Stacker to place an order, the information is immediately destroyed by Stacker after it has been used to process your order. By providing your email address to Stacker (whether through the Stacker website or otherwise), you acknowledge and agree that Stacker may notify you by email in the event of a breach of security involving your Personal Data. No method of transmission over the Internet, or method of electronic storage, is 100% secure. Although we strive to protect your data, Stacker assumes no responsibility or liability for damages incurred by unauthorized access to your Personal Data. If you have reason to believe that your Personal Data has been compromised, please contact us immediately at info@stacker3d.com . We do not knowingly collect or maintain Personal Data from anyone under the age of 18, unless or except as permitted by law. If we learn that Personal Data has been collected from a User under 18 years of age through our website or Services, then we will take the appropriate steps to delete this information. If you are the parent or legal guardian of a child under 18 who has used our Services or has otherwise transferred Personal Data to the website, please contact Stacker using our contact information below to have that child’s account terminated and information deleted.